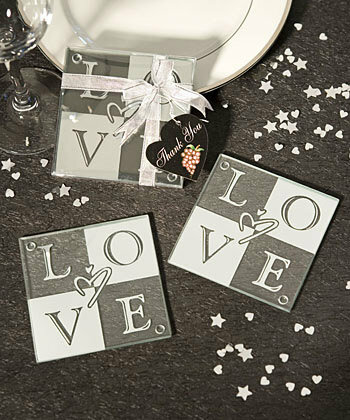 It`s easy to show some love with these clear glass LOVE coasters as stylish wedding favors and more. Declare your love with these playfully designed glass LOVE coasters! Lovely as wedding favors or for any occasion, your guests will adore these fun and functional home accessories. Each 3.5" coaster is made of tempered glass for extra strength. These wedding favors come festively packaged in a clear box tied with a bow. Each set of two glass LOVE coasters also includes a heart shaped vinyard collection thank you tag. Coasters are sold as a set of 2 in one packaging with ribbon and tag. Price is per set. I love this product I’m excited to give them away at my bridal shower. They came perfectly packaged I didn’t have to do anything further with them. They are durable and just a nice gift to receive that didn’t cost an arm and a leg! I bought these as bridal shower favors and they are beautifully packed, elegant and perfect! Even better than was expected. They are very nice and make a nice thank you gift for a wedding. I ordered pictures for the tags and they came out amazing. Best part was they included extra pictures in case you broke some. Will continue to order from this company. Any issues with your order they promptly send you an email alert with options. Love this company. Coasters arrived very quickly and well packed. None were damaged and exactly what I had anticipated they would be. Loved the high quality and timely delivery. These coasters are just right for favors. Nicely tied with ribbon with attached thank card. Packed great, no breakage. Price is incredible. Thank you so much! The quality and look of the "Love" coasters are awesome! Can't wait to give them to my cousin's guest at her wedding. These coasters are perfect for our wedding give away! they are so pretty! These glass coasters were perfect for a party favor for our son's wedding rehearsal dinner. They are of good quality and the service was excellent. Shipped within just a few days. Would use your website again. Very nice wedding favors. Shipped fast. Very nice inexpensive favors for party guests. I am impressed with the quality of the product. The coasters came well packaged so none were broken or chipped. I would not hesitate to make this purchase again. These are made of high quality glass. Perfect for wedding or bridal shower favors. My 20-something daughter LOVEd them! Good value and order arrived earlier than expected. Items were nicely packed to ensure items arrived in good condition. Very satisfied. Wonderful gift for party guests. Would order again! Quick Shipment. Items arrived sooner than i expected and the quality is great order for my wedding. Simple, useful, a great choice at a reasonable price.